In December 2017 and March 2018, I had the opportunity to work on some photo projects in Mexico. I present to you, in a series of three articles, my work on the sweatshops of the Tehuacán region in Mexico. Few people pay attention to the working conditions behind the consumer products they procure. This series of articles is a small window on the garment industries in Mexico. During my first stay, we were accompanied by Martin Barrios from the Tehuacán Labor and Human Rights Commission. He brought us to a waterfall of wastewater from washing jeans. We find a lot of these factories in the area. 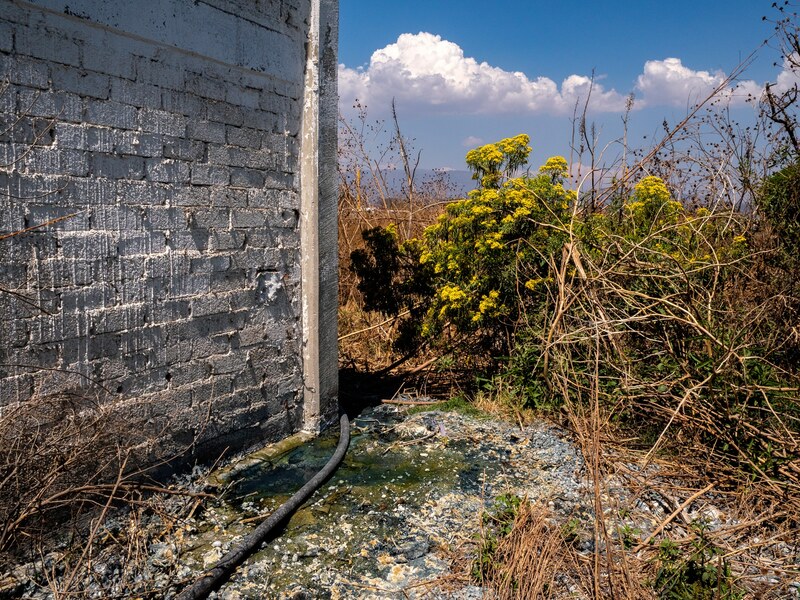 An industrial laundry in the Tehuacan area is located right next to the fields of local farmers. Before ending up on the local or international market, the jeans are washed to remove the excess dye or to give them their faded and worn appearance. Some factories also specialize in the cosmetic wear of jeans using silicate jets to make holes simulating natural wear. Stained blue stains are everywhere around the industrial laundry. It must be understood that the reason why your jeans do not fade in the wash is that they have previously rubbed off elsewhere. 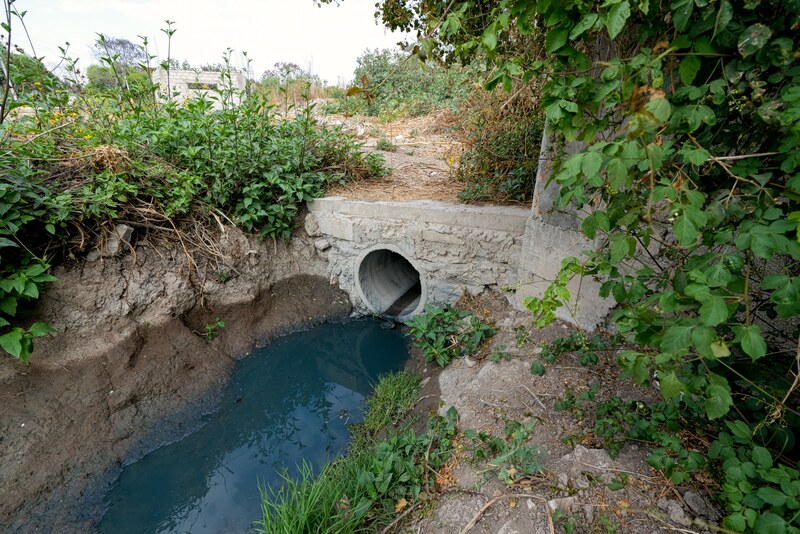 The concentration of jeans factories in the Tehuacán region means a concentration of contaminated waste water. The smell of these waters is nauseating. A thick foam covers the waters of the creek. A waterfall stained jeans tinctures of garment factories. Stagnant water shows the extent of contaminants. The traces of dye are clearly visible on the rock. Cotton is not naturally blue. The jeans must be dyed. It sounds obvious and simple, but it is far from being the case. Blue pigmentation is not present in nature. Before modern chemistry, the color blue was the most difficult for painters to obtain. The amount of blue in a painting was negotiated since it affected the price. The pigments were made from lapis lazuli, a semi precious stone. Nowadays, blue comes from big chemical factories. Its chemical composition is complex and is lighter than water, confining them to the surface of runoff. Tehuacan is known as the "birth place of corn" because there was found the oldest remains of the plant that is the basis of the Mexican diet. 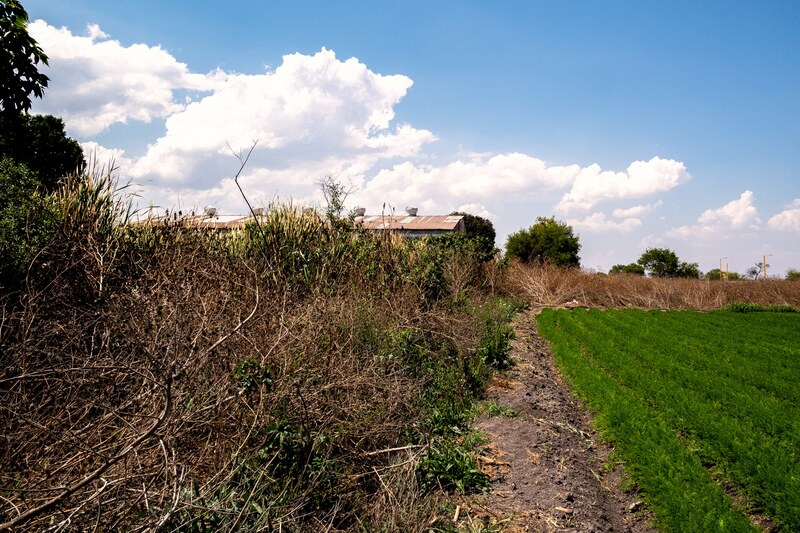 Today, the fields are irrigated by contaminated with water from the jeans factories. 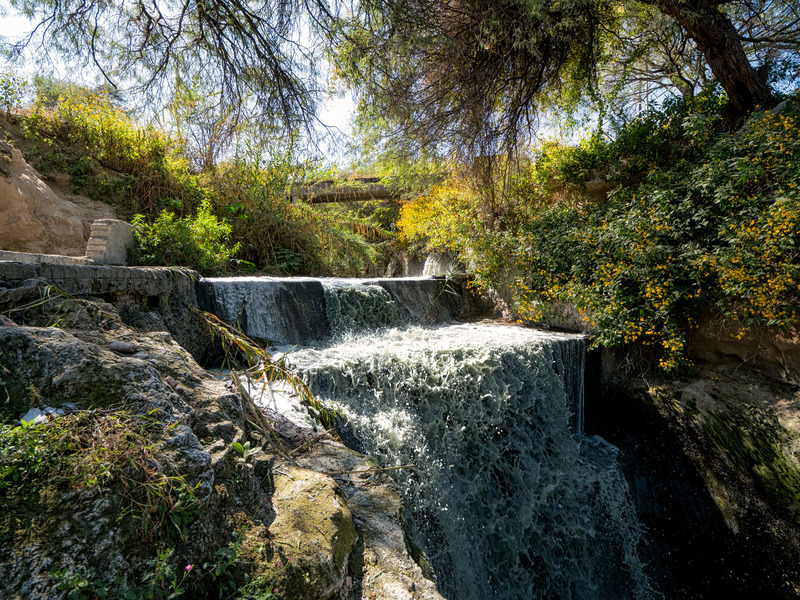 Wastewater from the mills is spilled and is found throughout the local stream system. 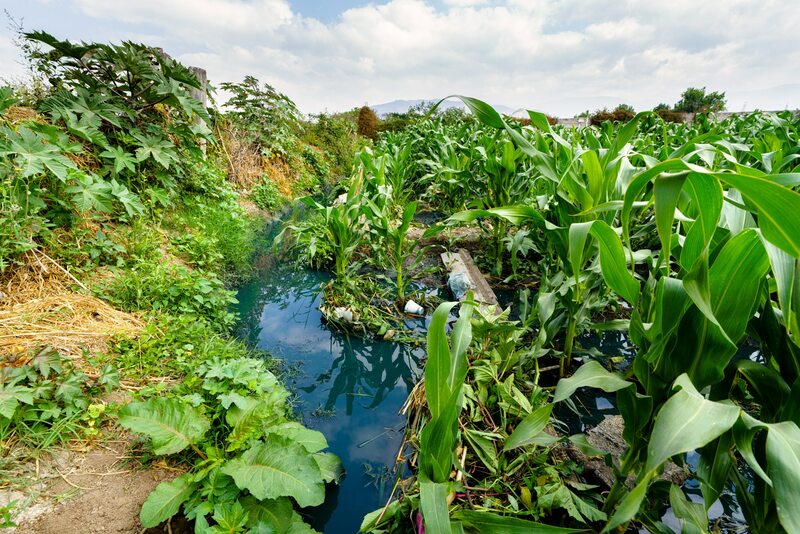 These streams irrigate the fields of local corn farmers. A peasant of the region with his oxen. 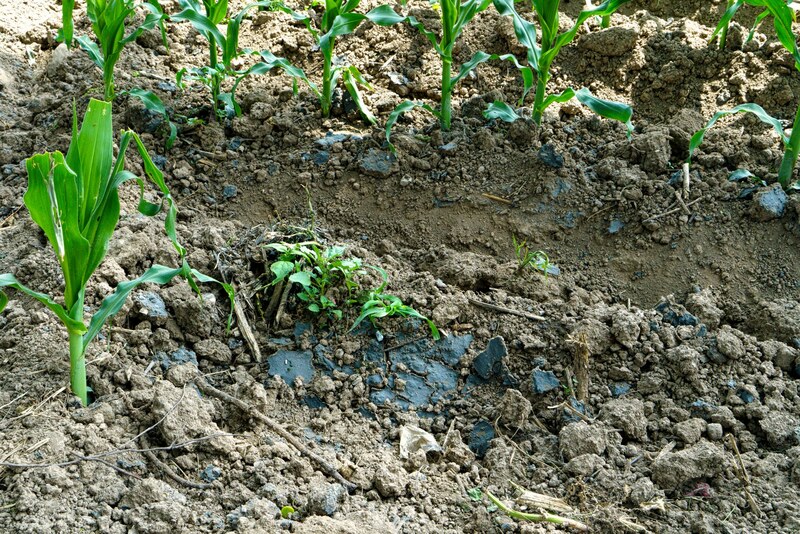 Farmers are generally poor and use rudimentary ways to grow their fields. 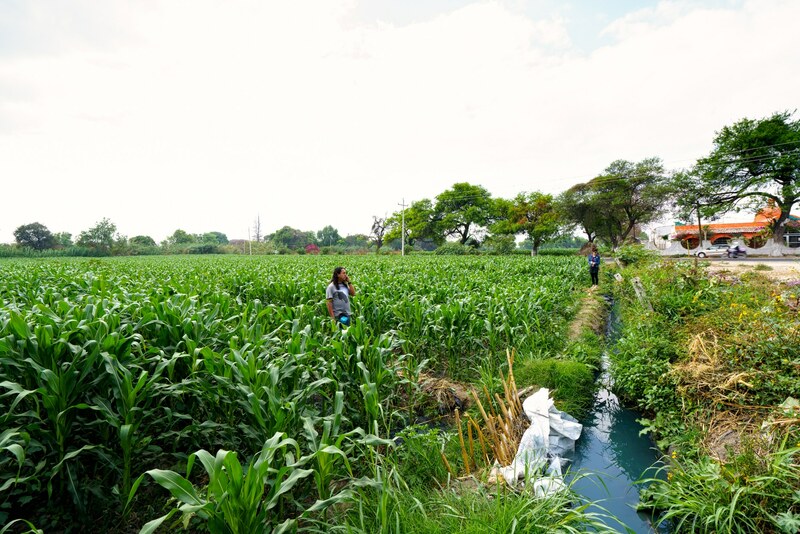 The blue water of the jeans cleaning plants is distributed by irrigation networks in the cornfields of the Tehuacan region. 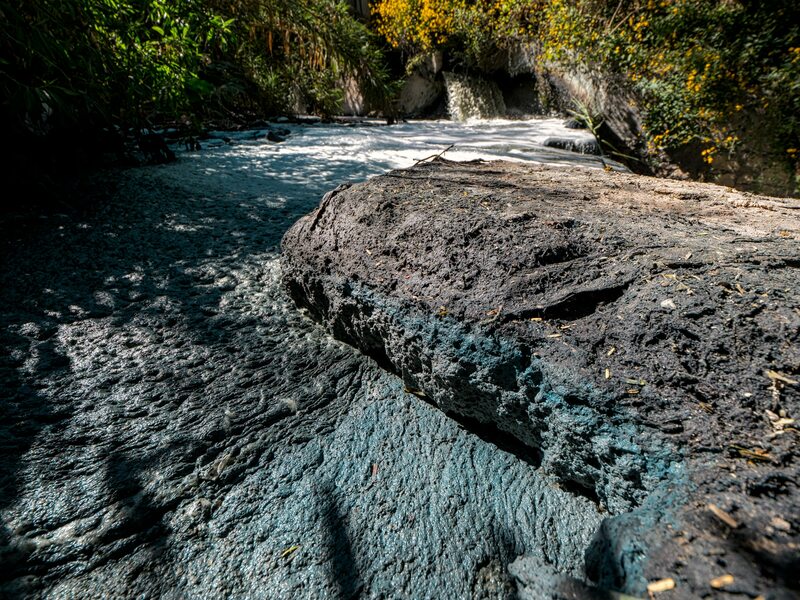 The concentration of dye in the water varies according to the proximity of the plants and the geology of the surrounding places. But, as we can see, this concentration of pollutants can be very important. The images are surrealistic. It is difficult to believe when you see it. This blue water is everywhere. 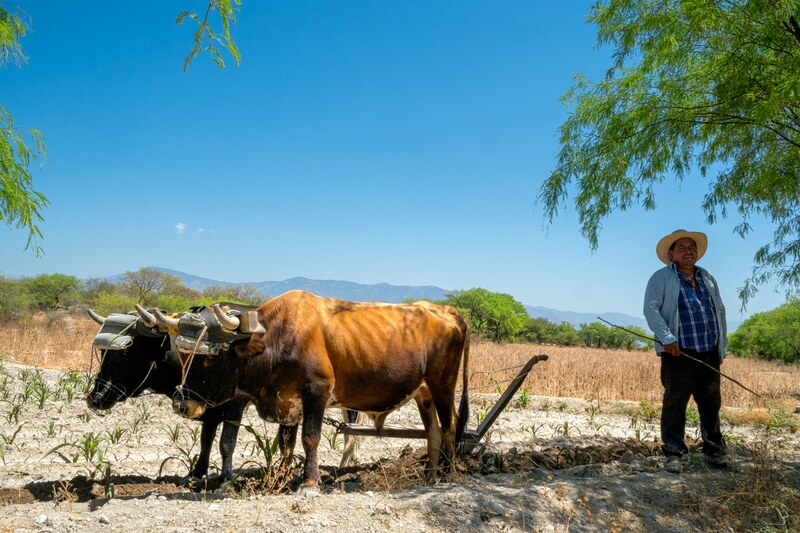 Farmers, for lack of other resources, are forced to use it to water their fields. 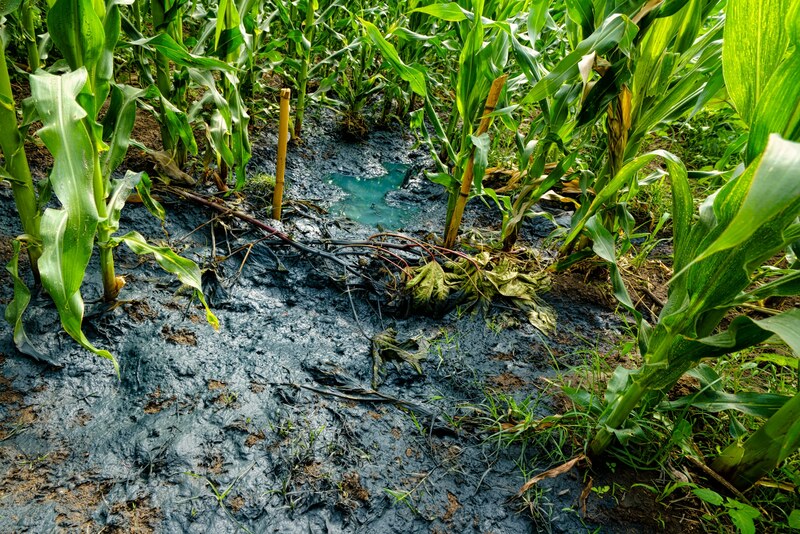 The rancid odor is everywhere and the muddy or dry residues are everywhere on the surface of the fields. The dirty water flows through and irrigates the cornfields. 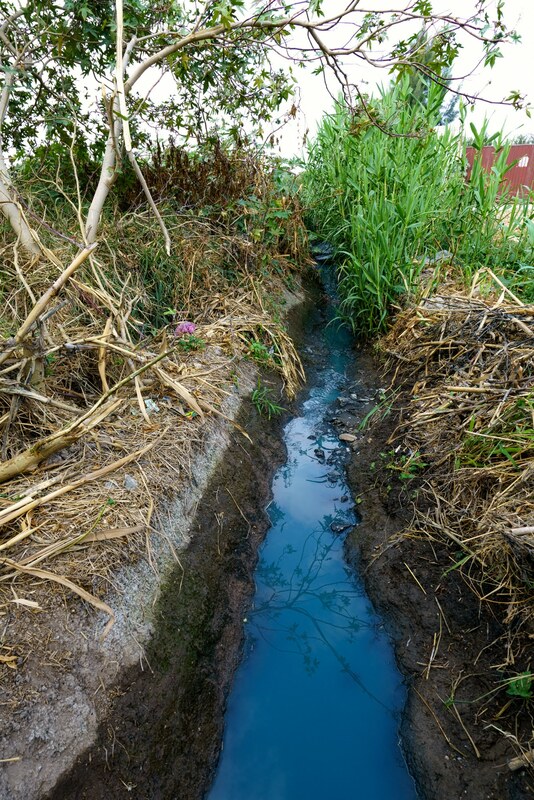 The blue water of the jeans cleaning plants forms a viscous mud on the surface of the fields. The dyeing deposits dry and form a crust on the top of the fields. I started this series of notebooks with the context of widespread violence in Mexico. 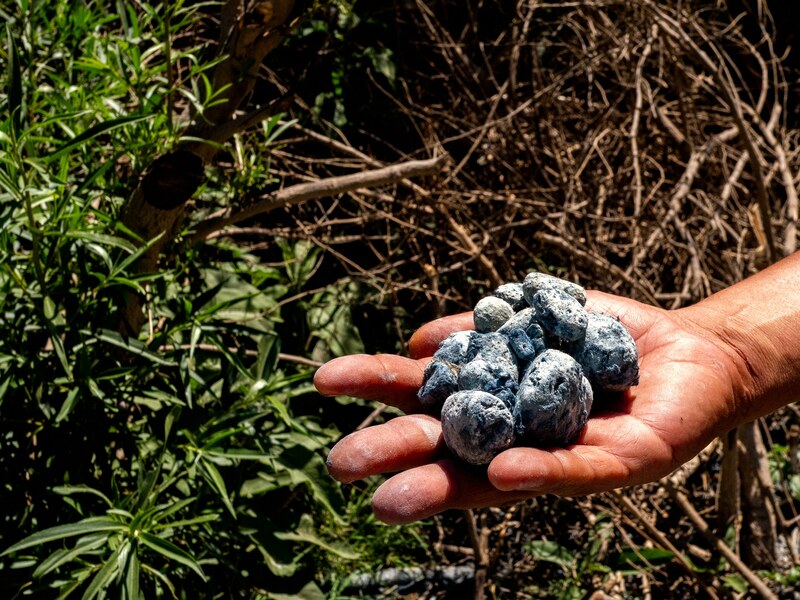 In Tehuacán, this violence is not just red blood, it is also blue jeans. You can go see my other projects by clicking here.